UTech, Jamaica Students Receive Carreras Scholarships and Bursaries — UTech, Ja. 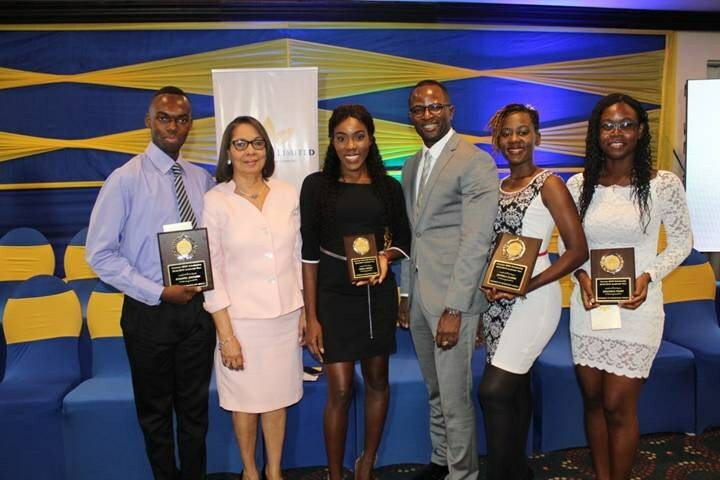 University of Technology, Jamaica students Schaffel Johnson, (left), Kedra Hodges, (3rd left), Jemmela Clarke, (5th left) and Jheanelle Peart, (right), display their plaques which they received at the Carreras Limited 2018 Scholarship Awards Ceremony on October 2, 2018 at the Pegasus Hotel in Kingston. Sharing in the are The Honourable Shahine Robinson, MP, Minister of Labour and Social Security, (2nd left) and Mr. Marcus Steele, (4th left), Managing Director, Carreras Limited. 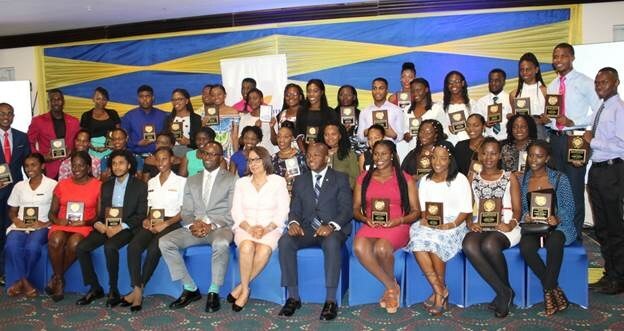 Five University of Technology, Jamaica students were among the forty-one tertiary students presented with scholarships and bursaries by Carreras Limited at its 2018 Scholarship Awards Ceremony held Tuesday, October 2, 2018 at the Jamaica Pegasus Hotel. The scholarships are valued at over two million dollars. The students are Danielle Hamil, 2nd year, Doctor of Medical Dentistry, (DMD), College of Oral Health Sciences, Kedra Hodges, final year, DMD who both received bursaries of $50,000; Schaffel Johnson, 2nd year Bachelor of Science in Environmental Health, School of Public Health and Health Technology and Jammela Clarke, final year, DMD, who received SEEK Scholarships valued at one million dollars each and Jheanelle Peart, 2nd year Bachelor of Science in Nursing, College of Health Sciences, who was presented with the at $100,000 HOPE Scholarship reserved for children of slain police officers. Mr. Marcus Steele, Managing Director, Carreras Limited in congratulating the awardees encouraged them to use the opportunity wisely so that they can enrich the lives of their own communities and the nation at large. Guest speaker, the Honourable Shahine Robinson, MP, Minister of Labour and Social Security told the students to take up the scholarship opportunity with pride as Jamaica has high expectations of them. She encouraged the scholarship awardees to become instruments of change, who embrace the observation of the law, do things right and are standard bearers of pride for Jamaica. The objective of the Carreras Limited Scholarship Programme is to increase access to college, increase academic achievement and to help retain high ability citizens in Jamaica. The Honourable Shahine Robinson MP, (centre, front row), Minister of Labour and Social Security and Senator The Honourable Pearnel Charles Jr.,(7th from left) Minister of State in the Ministry of Foreign Affairs and Foreign Trade and Mr. Marcus Steele, (5th from left), Managing Director, Carreras Limited pose for a group photograph with the Carreras Limited 2018 Scholarship Awardees from University of Technology, Jamaica, The University of the West Indies, Northern Caribbean University, The Mico University College, Shortwood Teachers’ College, Bethlehem Moravian College, Sam Sharpe Teachers’ College, Church Teachers’ College, Knox Community College, Brown’s Town Community College, Excelsior Community College, College of Agriculture, Science and Education, Moneague College, Portmore Community College, Edna Manley College of the Visual and Performing Arts and the Vocational Training Development Institute.